This reference topic for the IT professional describes the use of Windows authentication protocols used within the SSPI architecture. The Microsoft Security Support Provider Interface (SSPI) is the foundation for Windows authentication. Applications and infrastructure services that require authentication use SSPI to provide it. 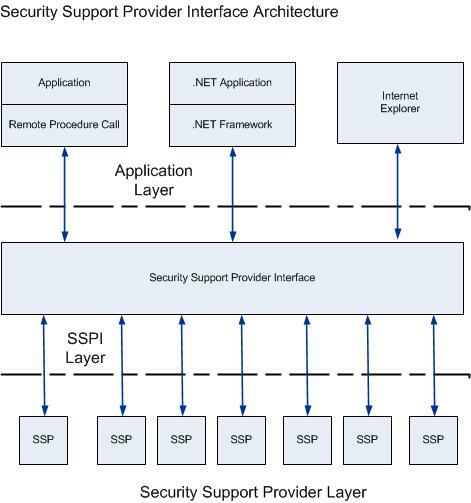 SSPI is the implementation of the Generic Security Service API (GSSAPI) in Windows Server operating systems. For more information about GSSAPI, see RFC 2743 and RFC 2744 in the IETF RFC Database. The default Security Support Providers (SSPs) that invoke specific authentication protocols in Windows are incorporated into the SSPI as DLLs. These default SSPs are described below. Additional SSPs can be incorporated if they can operate with the SSPI. The SSPI in Windows provides a mechanism that carries authentication tokens over the existing communication channel between the client computer and server. When two computers or devices need to be authenticated so that they can communicate securely, the requests for authentication are routed to the SSPI, which completes the authentication process, regardless of the network protocol currently in use. The SSPI returns transparent binary large objects—these are passed between the applications, at which point they can be passed to the SSPI layer on that side. Thus, the SSPI enables an application to use various security models available on a computer or network without changing the interface to the security system. The following sections describe the default SSP components that interact with the SSPI. Each of the SSPs is used in different ways in Windows operating systems to promote secure communication in an unsecure network environment. This SSP uses only Microsoft’s implementation of the Kerberos version 5 protocol, which is based on Internet RFC 4120 and draft revisions. It is an industry-standard protocol that is used with either a password or a smart card for interactive logon. It is also the preferred authentication method for services in Windows. The Kerberos SSP, Kerberos.dll, uses the Kerberos V5 authentication protocol (RFC 4120). The NTLM Security Support Provider (NTLM SSP) is a binary messaging protocol used by the Security Support Provider Interface (SSPI) to allow NTLM challenge-response authentication and to negotiate integrity and confidentiality options. NTLM SSP is used wherever SSPI authentication is used including for Server Message Block or CIFS authentication, HTTP Negotiate authentication, for example Internet Web Authentication, and Microsoft RPC services. The NTLM SSP includes the NTLM and NTLMv2 authentication protocols. Digest Authentication is an industry standard that, beginning with Windows 2000, is used for Lightweight Directory Access Protocol (LDAP) and web authentication. Digest Authentication transmits credentials across the network as an MD5 hash or message digest. Schannel implements the Secure Sockets Layer (SSL) and Transport Layer Security (TLS) Internet standard authentication protocols. Schannel is used for web-based server authentication, such as when a user attempts to access a secure web server. Note: PCT is disabled by default in Windows Server 2008 R2, Windows Server 2008, and Windows Server 2003. The protocol that is selected is the preferred authentication protocol that both parties can support. For example, if a server supports all the Schannel protocols and the client supports only SSL 3.0 and SSL 2.0, the authentication process uses SSL 3.0. The Negotiate (SPNEGO) SSP can be used to negotiate a specific authentication protocol. When an application calls into SSPI to log on to a network, it can specify an SSP to process the request. If the application specifies Negotiate, the SSP analyzes the request and picks the best SSP to handle the request based on customer-configured security policies. In supported versions of the Windows operating systems, the Negotiate security package selects between the Kerberos protocol and NTLM. Negotiate selects Kerberos by default unless Kerberos cannot be used by one of the systems involved in the authentication or the calling application did not provide sufficient information to use Kerberos. The Credential Security Service Provider, or CredSSP, provides a single sign-on (SSO) user experience when starting new Terminal Services and Remote Desktop sessions. CredSSP enables applications to delegate users' credentials from the client computer (by using the client-side security service provider) to the target server (through the server-side security service provider) based on client policies. CredSSP policies are configured by using Group Policy and delegation of credentials is turned off by default. Negotiate Extensions (NegoExts) is an authentication package that negotiates the use of SSPs, other than NTLM or the Kerberos protocol, for applications and scenarios implemented by Microsoft and other software companies. Rich client availability within a federated system. Documents can be accessed on other SharePoint sites and can be edited by using a full-featured Microsoft Office application. Rich client support for Microsoft Office Live. Users can log on to Microsoft Office Live services and use a full-featured Microsoft Office application. Hosted Microsoft Exchange Server and Outlook. There is no domain trust established because Exchange is hosted on the web. Outlook uses the Windows Live service to authenticate users. Rich client availability between client computers and servers. The operating system's networking and authentication components are used. The Windows Negotiate package treats the NegoExts SSP in the same manner as it does for Kerberos and NTLM. NegoExts.dll is loaded into the Local System Authority (LSA) at startup. When an authentication request is received, based on the request's source, NegoExts negotiates between the supported SSPs. It gathers the credentials and policies, encrypts them, and sends that information to the appropriate SSP, where the security token is then created. The SSPs supported by NegoExts are not stand-alone SSPs such as Kerberos and NTLM. Therefore, within the NegoExts SSP, when the authentication method fails for any reason, an authentication failure message will be displayed or logged. No renegotiation or fallback authentication methods are possible. The PKU2U protocol was introduced in Windows 7 and Windows Server 2008 R2 and implemented as an SSP. The SSP enables peer-to-peer authentication, particularly through the Windows 7 media and file sharing feature called Homegroup, which permits sharing between computers that are not members of a domain. The Windows SSPI can use any of the protocols that are supported through the installed security support providers. However, because not all operating systems support the same SSP packages that any given Windows Server supports, clients and servers must negotiate to use a protocol that they both support. Windows Server prefers client computers and applications to use the Kerberos protocol, a strong standards-based protocol, when possible, but continues to allow client computers and client applications that do not support Kerberos, to authenticate. Before authentication can take place, however, the two communicating computers must agree on a protocol that they both can support. For any protocol to be usable through the SSPI, each party must have the appropriate SSP. For example, in order for a client computer and server to use the Kerberos authentication protocol, they must both support Kerberos V5. Windows Server uses the function EnumerateSecurityPackages to identify which SSPs are supported on a computer and what the capabilities of those SSPs are. The selection of an authentication protocol can be handled in one of two ways, each of which is described in the sections that follow. The client computer requests access to a service. The server replies to the request in which it specifies the protocol that will be used. The client computer examines the contents of the reply and checks to determine whether it supports the specified protocol. If the client computer does support the specified protocol, the authentication continues. If the client computer does not support the protocol, the authentication fails, regardless of whether the client computer is authorized to access the resource. The server replies with a list of authentication protocols that it can support and an authentication challenge or response based on the protocol that is its first choice. For example, the server might list the Kerberos protocol and NTLM, and send a Kerberos authentication response. The client computer examines the contents of the reply and checks to determine whether it supports any of the specified protocols. If the client computer supports the preferred protocol, authentication proceeds. If the client computer does not support the preferred protocol, but does support one of the other protocols listed by the server, the client computer lets the server know which authentication protocol it supports, and the authentication proceeds. If the client computer does not support any of the listed protocols, the authentication exchange fails.